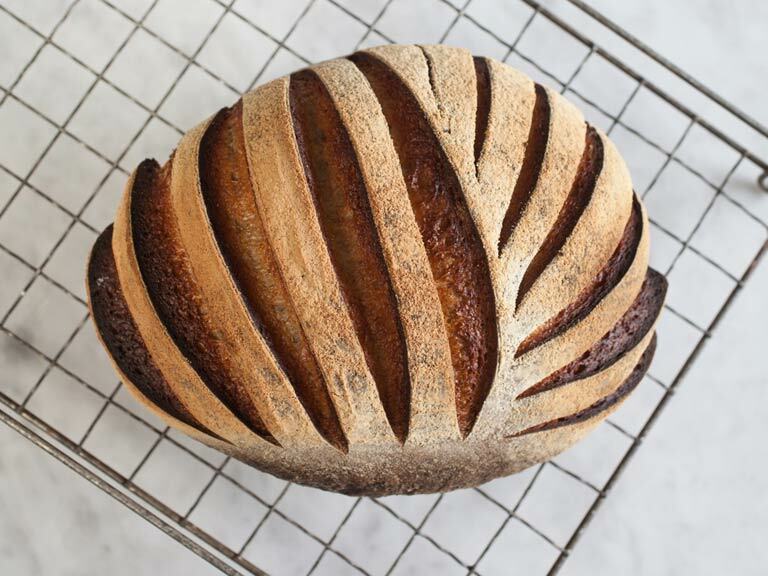 Try this recipe for maslin, a traditional sourdough loaf of bread made from rye and wheat flour. 1. Mix the pre-ferment ingredients together, cover and leave at room temperature overnight, or refrigerate overnight and bring it out 2 hours before needed. 2. Mix the pre-ferment and dough ingredients together, cover and leave to rest at room temperature for 10 minutes. Instead of kneading the dough, give it four separate single folds, with rests of 10–15 minutes after each fold, then leave the dough to prove for a further 1 hour. 3. Shape the dough carefully into a square about 1cm/.in thick. Break the cheese into pieces, distribute them evenly over the dough and gently press them in. Drizzle with honey. 4. Fold the 4 corners of the dough into the middle to cover the cheese, form the dough into a ball and seal the seams tightly. 5. Dust a proving basket well with semolina or polenta/cornmeal, shape the dough to fit and place it in, seam-side up. Cover and leave to prove for 4–6 hours at room temperature (alternatively, prove in the refrigerator overnight again, and remove 1 hour before baking). 6. Heat the oven to 240C/220C fan/475F/gas 8–9, with a baking stone or baking sheet in place. Dust a peel with semolina or polenta/ cornmeal, turn the dough out onto it and slash along the middle of the top with a sharp knife, or if you feel confident, slash a pattern into the dough. Slide the loaf onto the baking stone. Bake for 35–40 minutes until the crust is golden, or darker if you prefer.